When it comes to beauty for spring 2015, braids have dominated so many of the runways that it is safe to say that the hairstyle is officially back and on trend. New York designers like Peter Som created sleek versions for their spring presentations, while Georgio Armani showcased models donning a complicated mix of warrior-like knots. 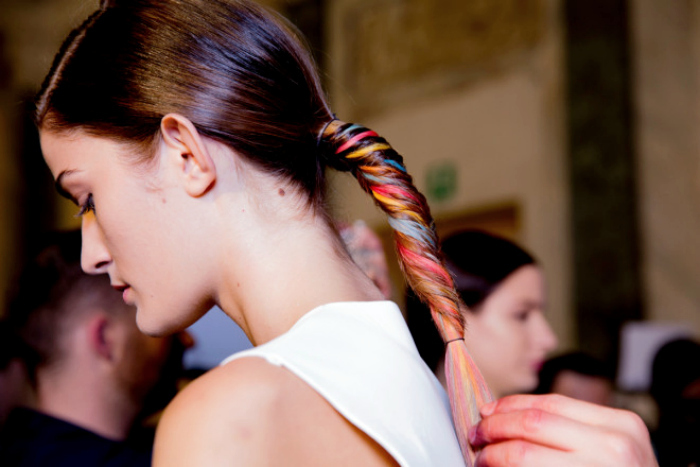 However, braids are nothing new when it comes to spring and summer beauty, so when this technicolor fishtail appeared in the Marco de Vincenzo collection, this mostly monochrome maven was completely and unexpectedly enamored with this fresh take on the idea. However, many of you are probably wondering how to pull this trend off without looking like you suffered from a tragic accident at the salon. I would suggest buying individual pieces that are already dyed or can be dyed, and weaving them into a fun ponytail. Also remember to keep your ensemble neutral, so that this trend can be the focal point and statement accessory of your look.